When word gets out that Louisa Holbrook died leaving her eighteen-year-old daughter Trudy with $10 million, the door is left open for men claiming to be Trudy�s long-lost father. 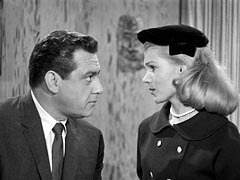 The first claimant (played by Hayden Rorke, the shrink on I Dream of Jeannie) appears right after Louisa�s funeral, and Trudy falls for him hook, line, and sinker. The rest of Trudy�s family is less than thrilled, especially her blind uncle Lawrence (played by silent screen hero Francis X. Bushman), the only one who knew Trudy�s real father. Then private investigators locate another man claiming to be Trudy�s father. But before old uncle Lawrence can decide who is the impostor, someone crunches him with a poker. As Trudy�s fingerprints are on the murder weapon, and she admits to having had a fight with her uncle, Tragg arrests her for murder. Naturally, Perry must clear her. After Louise Holbrook�s funeral, watch the roof-line of the early to mid-50s Cadillac (I think) limousine as it moves right to left. On what looks like an otherwise impeccably polished car, there are what appear to be a couple of good-sized dents. This seems out of keeping with the wealth of the family. (I�m estimating $10 million back then would be at least $100 million today). Added by billp, 12/25/08. + That Caddy limo is a '58 Series 75. Submitted by francis, 3/22/12. + see Car(1) below. GW. + Francis X. Bushman plays Lawrence King. Francis X. Bushman's first movie appearance was in 1911. I would be willing to bet that is a record for any actor appearing on Perry Mason. Submitted by PaulDrake 33. + It also must be noted that Francis X. Bushman�s most famous role was in the 1925 version of Ben Hur playing the villianous Massala. He certainly was in very good shape back then, sporting an impressive set of �guns.� Submitted by Kenmore 06/25/10. Gail Bonney, who plays the maid, was born Goldi Bonowitz, and she had a twin sister. Submitted by gracep 10/11/2010. Sightings: �Miss Carmody� ambles along in the first scene with the other mourners following the bereaved to her car. The prison guard in the courtroom looks rather like her as well. + Quiet Old Man #1 watches from the front row of the courtroom gallery near Perry Mason. The Cute Young Woman is in the back row. Meanwhile the Little Old Lady in Hat sits inconspicuously behind D.A Burger. A few seats to her right finds the Distingushed Lady #2, and behind her, Distinguished Gentleman #1. Read more about our favorite frequent faces, and help us find more. Submitted by gracep 10/11/2010. + We find Distinguished Lady #4 in the front row next to Quiet Man #1. Bill767 1/3/16. + Continuity: Sometimes the Gentleman is in the Lady�s seat (the Lady is on the other side of the courtroom, along with the Little Old Lady in a Hat) and uncredited actor Robert Wegner is in the Gentleman�s seat. Added by gracep 10/11/2010. Talman�s Troubles: This appears to be one of three episodes filmed before Talman was dismissed in March 1960, after he was arrested. The opening credits once again feature William Talman, whereas in the previous episode he was omitted. Read more about the credits, to get a beter handle on it. Read the trivia items for episodes #87-89 and #96-97 for more information about Talman's woes. Submitted by gracep 10/14/2010. CARS. (1) black 1956 Cadillac Fleetwood Series 75 Limousine, Lic No BEC 073, at the Holbrook estate. (2) Perry's black 1959 Ford Fairlane 500 Galaxie Skyliner, top down. (3) 1958 Ford F100 Panel (or '59) Fire & Amb. (4) medium-color 1960 Chrysler Imperial Crown Convertible, top down, registered to Donald J. Evanson, Lic No "TBH-731" on registration form. The Chrysler Imperial is the first non-Buick of the 1960 model-year to appear in the series. Added by Gary Woloski, 7/12/12. Evanson's Address on his car's Registration Form is a real residential address on Cheviot Drive in Los Angeles. This same address also appeared on John Addison's car registration in TCOT Vagabond Vixen (see Ep#9/Trivia/Murder Date). We've also seen the Studio Address 1040 Las Palmas appear several times on Automobile Registrations. Could it be that the Cheviot Dr address is also linked to General Service Studios, Paisano or CBS in some way? (YES, wait until Ep#188) Added by Gary Woloski, 7/13/12. When questioning Evanston about the distance he'd driven since the "grease job" earlier that day, Perry notes the mileage on the speedometer. Distance is measured on a car's odometer, not its speedometer. + Back in 1960 the average person wasn't so concerned about exact names. Many people considered both the speedometer and odometer to be parts of the same thing because they were usually displayed together. I fact I never even heard the term odometer until closer to the 70s. It's like the "accelerator pedal" was the gas pedal, or, just "the gas", as in "step on the gas". Only people with a need to be technical (policemen, some attorneys, etc) ever used the "exact" terms, but not always. You gotta remember that it was a MUCH simpler time back then. Things were so different back then that it's like being on a different planet today. Submitted by Arisia, 03/04/18. Syndication cuts: Scene with Evanson and Harper discussing Holbrook with David before Evanson tells his secretary to call the lawyers; Harper attempts to bribe Holbrook to go away with $50,000, Trudy listens and sends Harper away; David tells Trudy as she returns that Perry has been trying to reach her and shows her the newspaper headline, Trudy cries; the autopsy surgeon's testimony; part of Harper's testimony concerning Trudy in a tennis match and a scar on his forehead. Submitted by Wiseguy70005, 8/24/12. + Although not particularly obvious - at least to me, see below for further comment - Ms. Benton was actually quite a bit older than the role she played. Notcom, 120817. +George Stone as the Court Clerk gets 5 or 6 lines in this episode. For most of the 42 episodes where he appears as the Court Clerk, he just sits in the corner of the courtroom minding his own business. Submitted by PaulDrake 33. 16 September 2009. +Jay Holbrook #2 stated that Lawrence King paid Peter Sample by holding a wad of money toward him and asking him to take $1000.00. Most blind people have a system to keep track of their money so that they will know which denomination is in which place. You could not stay in business very long letting people pick money out of a $3000.00 roll. Submitted by PaulDrake 33. 16 September 2009. PM Marathon Alert: Hallmark Movie Channel is saying that they will run a 20-episode PM marathon on Sunday, 20 January 2013. Submitted by MikeM, 16 January 2013. 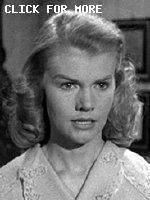 Twenty-seven year old Anne Benton seems to have forgotten what an eighteen year old acts like. She's acting more like a 13 year old child, to me. Submitted by Kilo 8/6/2017. +Agreed. My husband called her performance "Mouseketeerish." Submitted by catyron, 12/02/17.